Shonagh qualified as a dental hygienist from Newcastle-Upon-Tyne in 1990. She worked in General Practice in Manchester before returning to Inverness and has worked in mainly private practices in the area over the last 19 years. 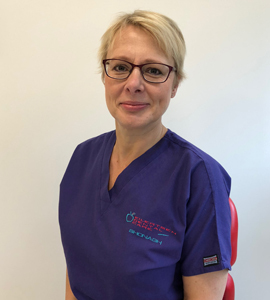 Shonagh attends Continuing Professional Development courses regularly as required by The General Dental Council and has a special interest in new treatments of periodontal disease and looking after patients with implants. Shonagh lives with her partner Rory and they have 2 young children. She enjoys pilates and is a keen swimmer. She also enjoys hill walking, preferably in good weather!